In Mindy Levine’s world, chemical molecules are talkative little beings, and she is trying to decipher how they communicate with each other when they are not attached. It’s research that can be applied to a variety of industries, from the development of tools for medical diagnostics to sensors for detecting toxicants in the environment. “If we can better understand the talking between molecules, we can use that knowledge to develop detection methods that are more sensitive and applicable in complex environments,” she said. Her research received a significant boost in February when she was awarded a $650,000 research grant from the National Science Foundation through its Faculty Early Career Development program, the most prestigious NSF grant program supporting junior faculty members. 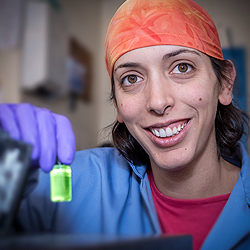 In addition to funding her research, Professor Levine’s grant will also support outreach activities designed to educate the public—especially high school girls—about chemistry and careers in science. For instance, she plans a “Sugar Science Day” in which 100 high school girls will spend a day at URI growing sugar crystals, measuring the sugar content of beverages and conducting other hands-on experiments with sugar. Two of the participating students will then receive a paid summer internship in her laboratory. These activities are a follow-up to Levine’s annual chemistry camp, which she holds during April vacation week for middle school girls to encourage their interest in science. This year’s camp features lipstick chromatography, the chemistry of bubbles, cornstarch relays, and other chemistry activities using common household products. “I want these girls to come out of this camp thinking that science is cool and that women can become scientists,” she said.